All clubs offer beginners courses and to find a club located near you click here or e-mail one of the contacts on the committee page such as the Chairman or Secretary and they will send you the name and telephone number or email address of your nearest club. The club will then explain how to find their archery course and let you know what evening they meet. ; Once you have obtained that information you simply go along to the club and you will be given an in-depth course of instruction on the basic techniques of archery and, most importantly, the safety rules will be explained. You should not buy any equipment before taking instruction as all equipment will be provided so the initial cost will only be that charged by the club for instruction. At the end of a 4 or 6 week course you will be invited to join the club and affiliate to the county, WAA and the GNAS. You will be able to continue to use the club equipment until you purchase your own. It is recommended that you seek the guidance of the club coach before you buy any personal equipment and they will advise you on the equipment most suitable for you. Archers often have secondhand equipment which they are prepared to sell but again you should seek the guidance and advice of the club coach before purchase. Archery is a safe sport and to keep it that way all archers must adhere to the strict safety guidelines published by GNAS. These will be explained to you when you receive instruction. The safety rules are in place to ensure that you achieve maximum enjoyment of the sport. Each club night there will be a designated member of the club who will act as 'Field Captain' and they will control the shooting. Once you have learnt a basic technique you will then, with the help of your club coach, decide which discipline you wish to follow, ie target, field or clout shooting. You will at that time also decide which type of equipment you would like to shoot. Target archery has been one of the most popular forms of archery practised world-wide. Outdoor and indoor target tournaments are held regularly at club, county and regional level. Target tournaments are shot on a flat, level ground and the targets consist of five brightly coloured rings which form scoring zones. The shooting distances vary from 18 metres (indoor) to 90 metres (outdoor). Outdoor target rounds involve shooting a set number of arrows at different distances and different target faces. The equipment used for target archery is mainly the recurve bow (the type used for the Olympics) and the compound bow. Field archery gives quite a different challenge to the archer. It is obviously an outdoor discipline where the course is laid out in a woodland setting taking advantage of the hills, slopes, angles, light and shade. It has been said that it is similar to golf where the targets, like the golf holes, are set at different distances and it is also akin to hiking where the slopes and hills lead you up and down. A field course is made up of 24 or 28 targets and depending on the round being shot the archer is required to shoot either three or four arrows at each target. Distances range from 15 to 60 metres and the target sizes range from 20 to 80 centimetres. 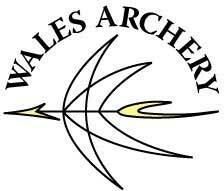 Clout archery is practised in Wales but is not as popular as target and field. The clout is a small round white target set on the ground, the ground being marked by scoring rings, the whole target area measuring 15 metres in diameter. The archer has to shoot at this ground target from distances up to 180 metres. The technique of lobbing arrows into the air so that they drop on the target follows old traditional medieval warfare techniques where all the archers of one army would shoot a shower of arrows into the air at the advancing army. The WAA adheres to the GNAS dress regulations for target archery, viz. white or green trousers or shorts (or ladies can wear skirts) and white or green tops. No patterns can be used on these items. On the other hand field archers usually wear bright clothes suitable for hiking/walking and which are easily visible in a wooded area. Camouflage clothing is not acceptable. The WAA complies with the Child Protection and Vulnerable Persons Policy laid down by GNAS, The Sports Council for Wales and UK Sport. This Policy was drawn up in conjunction with the NSPCC. Further information regarding the GNAS policies can be read here. WAA recommends that ALL clubs adopt the Code of Conduct laid down by the GNAS as this will give clubs a measurement of acceptable/unacceptable behaviour of club members. Clubs may wish to adopt it as part of their club constitution. WAA has signed an Anti-Doping Policy Agreement with UK Sport and the Sports Council for Wales.